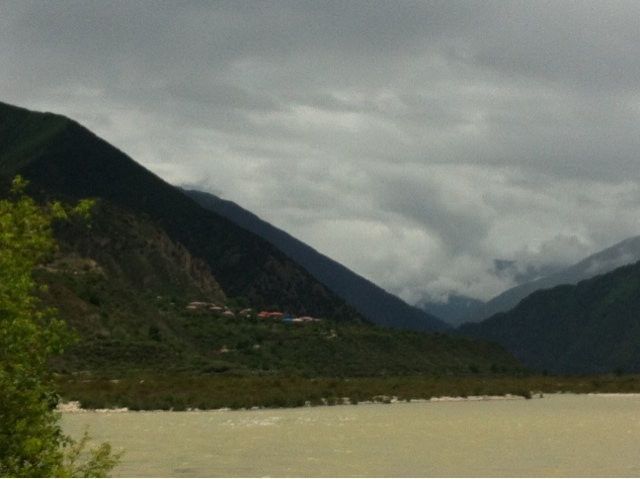 After a heavy overnight thunderstorm we departed Lhasa in a light drizzle under overcast skies. Unlike previous days, when the early cloud had cleared to offer blazing sunshine, the cloud stayed with us all day delivering occasional showers. The first 150km climbed to a 5000m pass through a valley which could have been in the Alps. Then down to a lunch stop town. Ordering food when the menu is in Chinese and you have no common language is entertaining. By pointing at the ingredients and miming "chicken" (cluck cluck flap flap) and chilli (yum yum ho ho) we managed to get a very good mushroom and noodle soup. As we descended, the valley narrowed into a gorge with a turquoise river rushing through it. The hills rose steeply on either side covered in pines and partly obscured by fluffy white clouds like a classical Chinese watercolour. All down the valley we passed Chinese cyclists toiling up the slope. Apparently cycling the Szechuan - Tibet Highway has become quite the thing to do in recent years. A perennial problem has been animals on the road. Through Tibet it has been mainly Yak and dogs. Today, suddenly and without warning we entered the Piglet Zone. Everywhere you looked pigs were rooting in the rubbish, wallowing in the ditches and running across the road. Could you not have 'phoned a friend'in Rugby/Derby for help with the menus?